Soliton IT has many RIS and reporting solutions successfully deployed in environments where file and data sharing is a pivotal element of the Trust’s workflow automation. 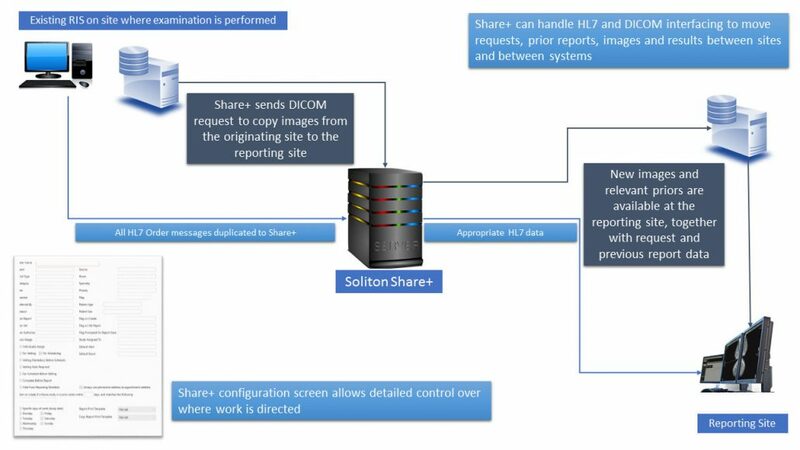 Share+ is a new application developed by Soliton IT to support our customers who have such file-sharing needs between separate organisations and systems. By applying our considerable experience in sharing and restricting data between UK healthcare organisations, Share+ has been developed as a new concept in vendor neutral data sharing. We’ve recognised that many NHS Trusts now outsource a percentage of their reporting to either meet turnaround targets or to extend their reporting capacity to meet demand. Previously, a Trust could invest in third-party private providers to outsource the reporting elements, however Share+ can now be applied to peer to peer NHS connections – producing a secure and reliable sharing relationship between two or more Trusts which in turn provides the sites with more workflow options and resources. This functionality is achieved by using standard HL7 and DICOM communication which allows users to use their existing RIS/PACS combinations and therefore optimise existing resources, maintain their current workflows and preserve user familiarity in their affiliate sites. Share+ also enables premium workflow management. The central repository can produce statistics on the work shared and performed by any organisation in the group as well as have a network-wide view of capacity, demand and utilisation. For added security and to optimise data control, the system’s “rules” engine enables originating sites to set sharing rules; sites can opt to share all or some of their reporting and in turn, create a fully shared and secured Trust network of reporting. Share+ is part of the suite of Radiology software solutions offered by Soliton IT and we are proud to be approved supplier on the NHS National Framework. For any questions about our range of systems, please Contact Us . To see our Share+ solution in practice at a customer’s site, please visit our Case Studies page .